Who loves a love story? Then join me in the tale of two Floridians, Javier and Amarylis, who won the prize for fall foliage when Javier proposed during a Smoky Mountain trip! It's May! Springtime! So why is it snowing in the Smokies and what are we going to do about the roads blocked by trees toppled in 98 mph winds? 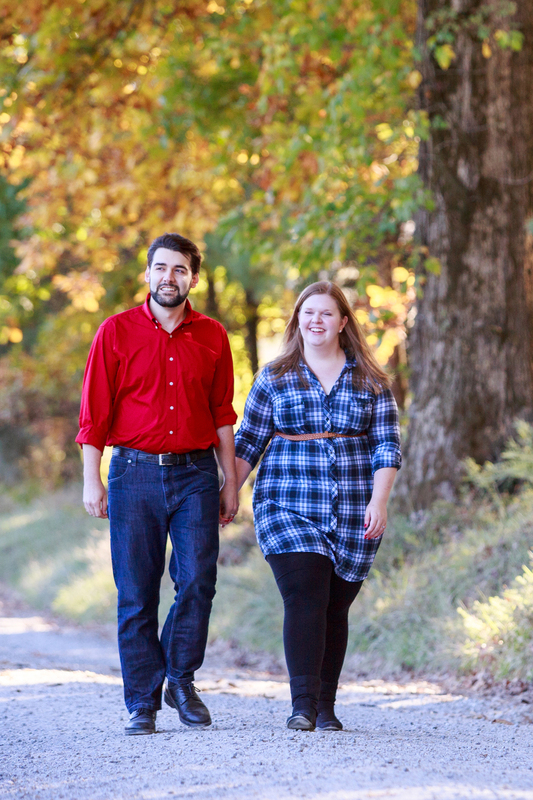 Despite these conditions, Dustin still got to bring his lady love to the Smokies and ask Brianna to marry him - read their story! Spring is almost here, but a young man's fancies turn to love way before it arrives, trust me. I was contacted by a delightful fellow named Sean. Seems he did a search online for "guerrilla proposal photographers" in the Knoxville area - at least, that is what he told me - and my name came up. We chatted and soon Operation Jessica was underway. But where to have it? Sean wanted, as most guys do, some privacy, but preferably a place easy to access and near a stream - it seems the first date he had with Jessica was a picnic by a stream, and he wanted to preserve that memory. Oh, and in the Smokies, of course, as they would be visiting from Alabama and staying in Gatlinburg. And horses, if at all possible. Unfortunately, this time of year sees all the stables in the area closed. But . . . deer. At least some nearby. With that in mind, we decided on Cades Cove, after some discussion and me emailing him pictures of various sites as suggestions. Specifically, this would take place along Sparks Lane at Abrams Creek. Picturesque. Semi-private. Water. And a plan was put together. No, I mean it - a plan, written down. The image above is one of the pages sent to him. When I do a proposal, I go out to the site and take pictures, so the groom-to-be can see where it will take place, and have arrows or other marks to show him how it will be set up and directions to follow. We exchange phone numbers so things can be coordinated. Which proved useful when Sean and Jessica got delayed driving up and he was afarid he would not make it to the rendezvous spot on time - Forget GPS, I was able to give him an alternate route that not only got them to Cades Cove on time, but spared them the misery that is the Friday traffic of Pigeon Forge. Son, I got you covered - and I am bound and determined to see this proposal take place! I told Sean, take your time - walk down to the creek, relax, stretch your legs. Wait for cars to pass by so they are not in the shot (fortunately, this was a Friday afternoon in February, so the Cove would not be crowded). When the time is right, whip out the ring and get to business! Sean looks around to note my position. Okay, this is happening. In the meantime, I have nicely asked a car coming on my side of the creek to hold back for a few minutes. People are happy to help. Yes, yes, enjoy Abrams Creek. Reminisce about your first date. Set the mood. Ah, good - head over the designated spot. But, wait, is that a . . .? Cars coming! Sean remembers to wait, and after they've passed . . .
And happiness this ensued . . .
A few hiccups but this is real life. Now they have this moment to share with friends and family (if not someday their children and grandchildren) and will be able to return to "their spot" by Abrams Creek along Sparks :Lane in future visits. Sure, it takes some reconnaissance and planning, but you'll be the hero for arranging this. Congratulations to Jessica and Sean - may they have many years together in health, prosperity, and happiness! 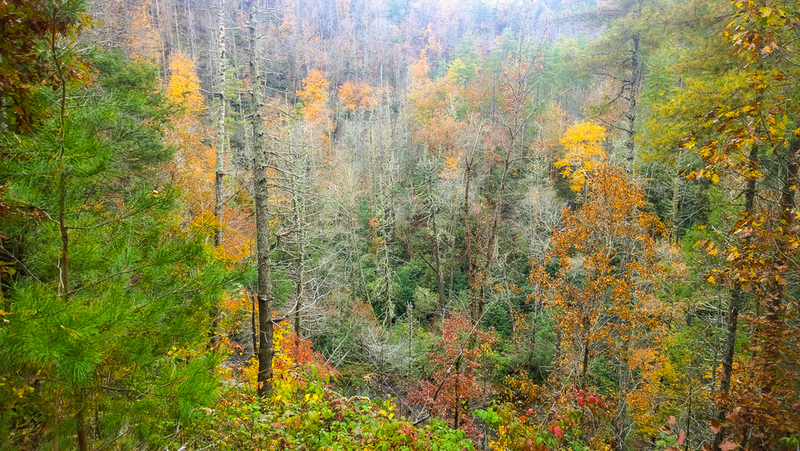 Unfortunately, my Halloween was made sad by the death of our family cat on the day before, so to soothe my spirits, I take to the trails in the Smokies. 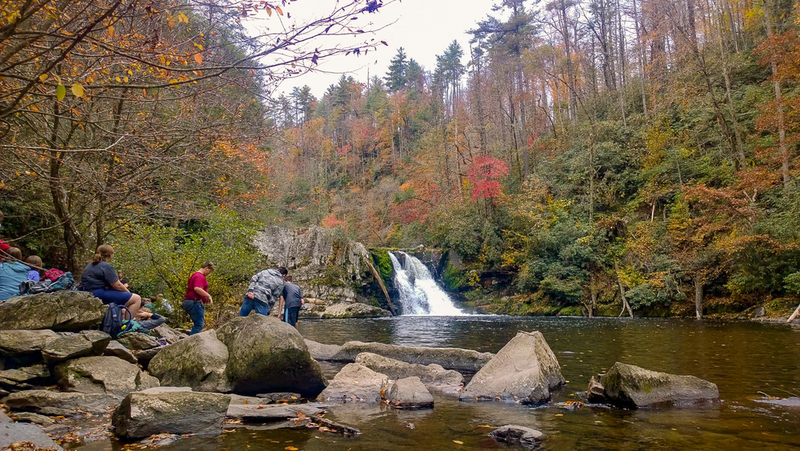 I always wanted to see Abrams Falls and figured that although the trip to get to its trailhead would be crowded with leaf peepers through Cades Cove, it was better than staying home to mope. I got to the trailhead at noon. The sky was overcast and the temp was 57. Although there was a long line of cars on the loop, I was surprised to find relatively few people at Abrams Creek. The trip is 5 miles roundtrip, with only an elevation gain of about 600 feet - not bad. Despite my old knees, I got back to the parking lot at 2:40 pm, and that included a 30-minute stop at the falls to eat my lunch and kick back. Click on any image below to see a larger size. 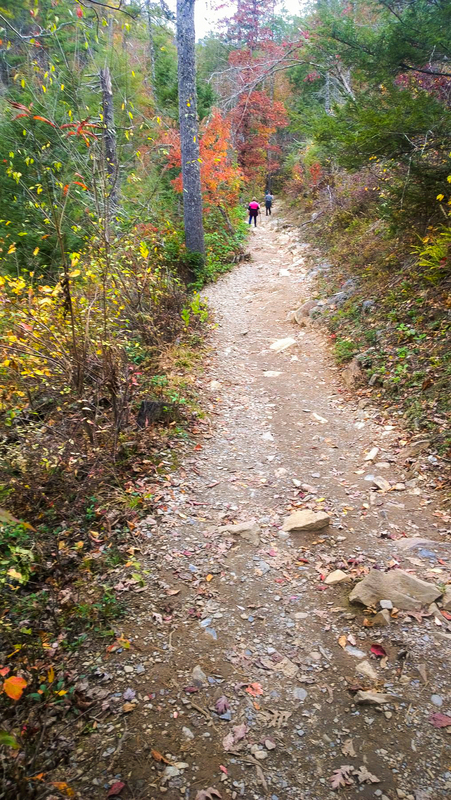 The trail is typical of East Tennessee: roots and rocks. I did not see any bears - at one point, I heard something big in the brush, only to have a girl walk around the corner and say, "It's okay - it's just my brother taking a pee!" I occasionally stopped when I was nearer the creek to look for movement by the water, hoping to spot an otter, but did not see one. I can always tell when I am nearing the trailhead on the way back - I started running into people who had started their hike. One woman asked me, hopefully, "I'm about halfway there, right?" No, ma'am, you're not - but take your time and hike your own hike. Rest in peace, our Ronnie. You were loved, little girl. On the bride at the trail head for the Abrams Falls trail. When I photograph an engagement session, it is important to me to help choose a location that has meaning to the couple. With the case of Elizabeth and Andrew, that selection also gave me the chance to shoot in my beloved Smokies. Despite the number of visitors this time of year, the three of use decided the best place would be Cades Cove. Cades is VERY popular because it follows an 11-mile loop around the cove and is one of the prime spots in the Great Smoky Mountains National Park to view what so many people hope to see: the black bears. Even if you don't see bears, the cove usually offers the chance to spot deer, wild turkey, and coyotes. But we were not there to shoot wildlife. Instead, we chose to find well-known spots in the cove. You see, Cades Cove was first settled in the early 1800's and the last resident left in 1999, after the federal government bought the homesteads and farms to create the national park. Andrew is a historian who has done projects about the cove's residents - but much more than that, he is a direct descendant of the families who lived here. He's kin - and in East Tennessee, that carries a lot of meaning and importance. Elizabeth had asked me if I thought it odd that they wanted to be photographed in one of the cemeteries, since they are both aficionados of visiting old graveyards. Not at all! In fact, I daresay since we visited the resting place of some of Andrew's ancestors, they would be delighted to see their future generations come back to share in their happiness! At the Cable Cemetery near the mill. Remember, pictures are for now AND the future. These images may well be viewed by not only their children, but their grandchildren and maybe even beyond that - and they will be able to see where their roots lie in the mountains. And know where home begins. Click on any image above to view in a larger size.